Cody, who was Mercy’s first special needs adoption, recently visited our Nashville Mercy home for a tour with his mom, Lori. They came to see how Mercy has grown since Cody’s adoption in Nashville 22 years ago. 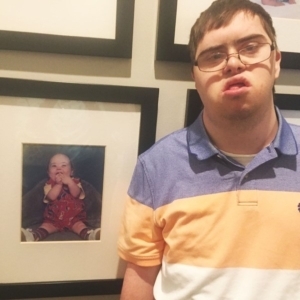 While visiting the Mercy Nashville home, they had the opportunity to see Cody’s picture on our Baby Wall of Fame. The Nashville home has hallways filled with photos of the babies who came to Mercy and were parented or placed for adoption. Lori is a pediatrician and she recently opened a special needs clinic in Memphis called Cody’s Center of Hope, Dedicated Pediatric Care. She started this practice after experiencing struggles in the medical community while working with individuals with special needs. Lori said it was a lifelong dream to provide a comprehensive approach to children with special needs. Since Mercy opened in 1983, there have been over 150 adoptions through Mercy’s licensed child-placing agency. As an approved Tennessee Licensed Child-Placing Agency, we can conduct adoptions for expectant mothers who are current Mercy residents and desire to place their child for adoption. To read more about Mercy adoptions, click here.